The 2018 food pavilion will feature catered appetizers, lunch entrées and desserts in a joint presentation by Matador Paella, Ranch Events, and Something Delicious Catering —picnic style under the shade of a giant oak tree. Included in the Passport Admission ticket. 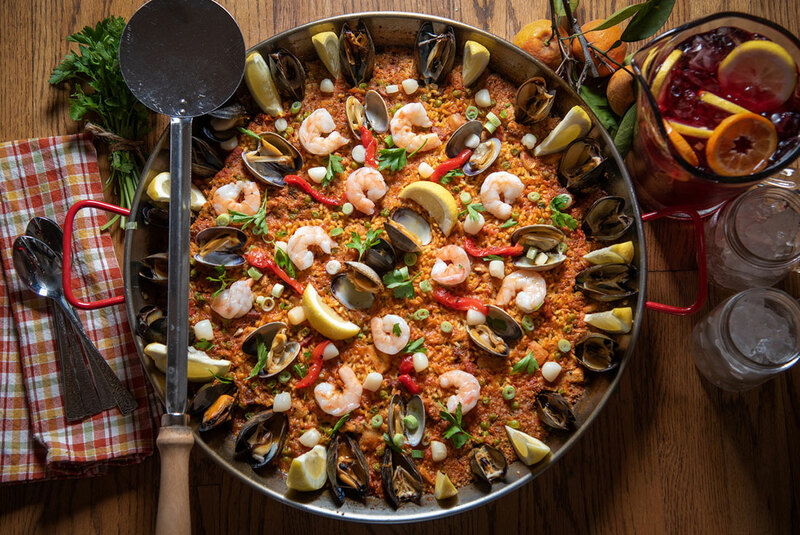 Served from 12:00 noon until 4:00 p.m.
Matador Paella brings together traditional Spanish paella, with California and Baja flavors. Matador can cater to groups of 25-500 while uniquely catering to individual needs, including private events, weddings, wineries, festivals, corporate, and breweries. Matador Paellas are made with authentic Bomba Rice, Saffron and Extra Virgin Olive Oil imported from Spain. Created with Matador’s signature sofrito base and served with roasted garlic and lemon aioli to add depth, richness and spice. Matador Paella will serve: Paella with Boneless Chicken, Spanish Chorizo, Shrimp, Scallops, Mussels, Squash, and Mushrooms. Ranch Events will serve: Fire Grilled Tuscan Beef Skewer with Fingerling Potato as an hors d’oeuvre and for dessert, Two Trifle Shots: Macadamia, Mango Trifle with Passion Fruit Caramel AND Chocolate. Kitty Bresendine, the chef of something Delicious Catering, is passionate about food. After dazzling her friends and family for years, the transition to cooking for the public in competition barbecue nine years ago was an easy jump. Their team “Here’s the Rub BBQ” has won awards at many competitions throughout California. Kitty attended the North County culinary Academy and earned a spot on the Dean’s List for her accomplishments. Five years ago she made the switch from busy office manager to a full time Personal Chef and caterer. “Something Delicious” offers Personal Chef services, wine and beer pairing throughout Ramona’s growing wine industry, private dinners and parties, and cooking lessons throughout San Diego County. Something Delicious will serve: Assorted Stuffed Mushrooms as an hors d’oeuvre. For a main course — Brown Butter Sage Chicken & Butternut Squash Pasta; Green Salad; Garlic Roll. And for dessert Assorted Ooey Gooey Bars.